Battling strong winds, the Cardinal breezed to their third straight Pac-12 title winning by 29 strokes over Cal on the strength of steady play by its deep team. Stanford, with an 18 under par performance, was the only team to finish under par for the tournament. The Cardinal had three players finish among the top 10, led by David Boote (Tied for No. 3, 7-under), Franklin Huang (No. 5, 5-under) and Maverick McNealy (No. 6, 3-under). In individual scoring, Boote tied for 3rd (68-66-70-73 277 T3), Huang finished 5th (66-72-68-73 279 5th), McNealy was 6th (69-71-67-72 281 6th), Jeffrey Swegle tied for 11th (76-64-71 73 284 T11), Viraat Badhwar tied for 15th (74-68-70-75 287 T15) and Brandon Wu tied for 28th (75-67-75-75 292 T28). Final team standings and Stanford 4th round scorecards are shown below. Stanford extended its 2nd round lead from 5 to 12 strokes over California and 31 strokes ahead of 3rd place USC as the team once again shot the low round of the day with a 7-under par 348 team score counting the low 5 of 6 players. No other team broke par as Cal's 355 was the next best score. Stanford at 1036 (29 under par) and Cal at 1048 (17 under par) are the only teams under par. Solid play by Stanford's deep team of 6 players was on display once again led by a Franklin Huang's 3-under par 68, followed by Maverick McNealy's 69, David Boote and Viraat Badhwar's 70s and Jeffrey Swegle's even par 71. Brandon Wu was the only Cardinal over par with 75 on the day. On his 12-stroke lead heading into the final round, Ray responded, “I wish it was 20 against those two teams. Anything can happen, but I think our guys will focus on hitting good shots and controlling the things that we have control over." Individual scoring thus far finds Boote tied for 2nd (68-66-70 204 T2), Huang in 5th (66-72-68 206 5th), McNealy tied for 8th (69-71-69 209 T8), Swegle tied for 12th (76-64-71 211 T12), Viraat Badhwar tied for 15th (74-68-70 212 T15) and Brandon Wu tied for 29th (75-67-75 217 T29). With one round to go, team scoring and 3rd round scorecards are shown below. Day 1 of the Pac-12 Championship included 36 holes of play by Stanford's 6 players and found the Cardinal charging into the lead by 5 strokes over California on the strength of a brilliant 19 under par 336 total in the 2nd round, the low team round by 7 strokes thus far. "This was a great start for the team in some very tough conditions," said Conrad Ray, Stanford's Knowles Family Director of Men's Golf. "I was proud of the guys and how they hung in there and managed their games and stayed away from the big numbers. "We have a lot of golf left against a strong field on a tough course, but we're happy with how we got out of the blocks. All the guys made some great contributions today." Morning temperatures that hovered in the low 40s and gusty winds greeted the Pac-12 golfers which made for some challenging play in the first round as only two teams were able to shoot par or better. Cal's KK Limbhaust shot 5-under to pace the Golden Bears to a first-round lead with a team score of 5-under, two shots better than Stanford. As winds calmed and the temperatures warmed in the afternoon, Jeffrey Swegle posted the low round of the day with a 7-under 64 to lead the Cardinal surge in the second round. Round 2 was highlighted that career low 7-under 64 by sophomore Swegle, in a round that included 8 birdies and only one bogey. Stanford's 6 players carded a stunning 32 birdies and 1 eagle in round 2 alone. Stanford impressive depth was revealed as it had 7 of its 12 rounds played in the 60s as the next closest team had only 4 of its rounds in the 60s. David Boote played brilliantly and is in 2nd place overall after rounds of 68-66 134, two strokes behind Limbhasut. Franklin Huang is tied for 6th overall after his rounds of 66-72 138, followed by Swegle (76-64 140) and Maverick McNealy (69-71 140) who are tied for 12th. Brandon Wu (75-67 143) and Viraat Badhwar (75-68 143) are tied for 20th. "That was a big first round for Franklin. He's been really trending the right way and has had a couple of good weeks the last few tournaments," said Ray. "Franklin was our rock this morning, for sure. That first hour and a half it was about as tough as you are going to get. "This afternoon we got some momentum going. Jeffrey Swegle really got hot at the end and birdied his last three, and then David Boote dropped in eagle on the last hole. It's fun to finish strong, but knowing there's a lot of golf left and the forecast isn't great, we have to show up tomorrow and take care of business." Round one scorecards are shown below, followed by round 2 team and Stanford scoring. * No. 4 Stanford seeks a third straight league title when it travels to The Country Club in Salt Lake City for the Pac-12 Conference Championships. The Cardinal could become the first program to win three consecutive Pac-12 crowns since Arizona State copped six from 1995-2000. * The Cardinal is coming off a team win at the Western Intercollegiate, its lone win on the season, but has earned nine top-10 showings in 10 events. Stanford has five top-five finishes in 2015-16. * Stanford is paced by the nation's top-ranked golfer (Golfstat and Golfweek individual ranking), junior Maverick McNealy (69.04 stroke average, four medalist honors). McNealy has won 10 times in his career and trails the school record of 11 victories shared by Tiger Woods and Patrick Rodgers. * In 27 rounds, Maverick McNealy has posted a score in the 60s in 16 rounds. The average score for those 16 rounds was 66.6. * David Boote (71.07) has seven top 25 finishes this season. * Entering the Pac-12 Championships, Maverick McNealy's 69.04 season stroke average is the second-best in NCAA history. Wake Forest's Bill Haas set the benchmark (68.93) in 2003-04. At the conclusion of the 2014-15 season, McNealy's 69.05 average ranked second. * There are 30 golfers in the Pac-12 with sub-73 averages, including Maverick McNealy (1st - 69.04), David Boote (7th - 71.07), Brandon Wu (17th - 72.21), Jeffrey Swegle (21st - 72.39) and Viraat Badhwar (26th - 72.67). Wu's mark is the second-best of any freshman. * This will be the fourth straight Pac-12 Championship for senior David Boote and the third straight Pac-12 Championships for juniors Viraat Badhwar and Maverick McNealy. award in men's college golf, The Ben Hogan Award is presented annually to the top men's NCAA Division I, II or III, NAIA or NJCAA college golfer taking into account all collegiate and amateur competitions during the past 12-month period. * Three Pac-12 golfers will participate in the 2016 Palmer Cup. 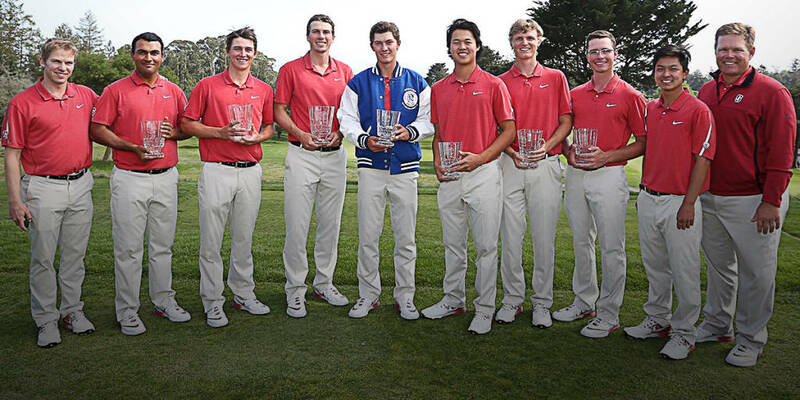 Stanford's Maverick McNealy and USC's Rico Hoey will represent the United States, while Stanford's David Boote (Wales) will represent the European squad. The annual Ryder Cup-style competition will be played June 24-26 at Formby (England) Golf Club. * Seventy-two holes of stroke play golf over three days of competition shall decide the Pac-12 championships. The 36-hole day of competition will fall on the first day of the tournament. The championship will be played in groups of three to ensure competition is completed on time. * In the event of a tie for the team championship, NCAA team tie-breaking procedures shall be followed to determine the champion. If there are three or more teams involved in a playoff, the shotgun format listed in the 2016 NCAA Division I Men's Golf Championship Handbook shall be used. For a two team playoff holes will be holes 18, 10 and 11 played in a loop until a champion is determined. If a shotgun format is needed, holes 10, 11, 12, 16, 17 and 18 will be used. * In the event of a tie for the individual championship, a sudden-death playoff shall be held immediately after the conclusion of the final round to determine the champion. If the tie is between members of the same team, the playoff shall be held at the discretion of that team's coach, who shall be allowed to determine whether a playoff shall be held. If a playoff is not held, the individuals shall be declared co-champions. In the case of a playoff, holes 18, 10 and 11 will be played in a loop until a champion is determined. * The five players with the low scores on a team for any 18-hole round shall constitute the scoring members of the team for that round (6-count-5), and the team with the lowest total combined score for all rounds shall be the team champion. * This marks the first year for the Pac-12 Championships to be held in Salt Lake City. The Country Club is one of the oldest clubs in the western United States. Founded in 1899, it has had a rich history of excellence. The Club is located on the southeast side of Salt Lake City in the foothills of the Wasatch mountain range just 10 minutes from downtown Salt Lake. The Country Club was the site of many PGA events over the years including the Utah State Golf Championships, the Utah State Amateur, Bob Hope and Bing Crosby's USO Charity golf tournament, and the 44th Western Open Championship. The Country Club played host to the Western Athletic Conference Championships in 1975. * Stanford successfully defended its Pac-12 title by posting a 14-stroke victory at the Palouse Ridge Golf Club in Pullman, Washington. The Cardinal trailed by 14 strokes heading into the fourth round, but were led by McNealy's course record-tying final round of 9-under 61 to cruise to victory. McNealy posted a Pac-12 Championship record four-round low score of 262 (18-under) to earn Pac-12 medalist honors with a 10-stroke victory. McNealy was named the Pac-12 Men's Golfer of the Year. * Stanford clinched the inaugural Pac-12 title in 1960 and has since won the conference championships in 1968, 1970, 1974, 1977, 1992, 1994, 2014 and 2015. * In 2015, Maverick McNealy's final round 61 at Palouse Ridge GC in Pullman, WA and in 1996, Tiger Woods' 61 at the par-72 Big Canyon Country Club in Newport Beach, California, were the second-lowest single round scores in the history of the Pac-12 Championships. Only Paul Casey's collegiate-record 60 in the 1999 league meet was lower. Woods fired a Pac-12 Championships record 11-under in his round. Stanford sends 8 players to compete in the 70th annual Western Intercollegiate event held at famed Pasatiempo CC in Santa Cruz, California, about an hour's drive south of the Stanford campus. World renowned architect Alistair McKenzie (Augusta National, Cypress Point are two of his best known works) designed this great course and lived on the signature 16th hole for many years later in his life. Six players will play in pairs in this unique 14-team event hosted by San Jose State with the best five scores counting each day. Maverick McNealy will pair up each round with Viraat Badhwar, David Boote with Jeffrey Swegle, and Franklin Huang with Brandon Wu. Bradley Knox and Dominick Francks will compete as individuals. Six Pac-12 teams are entered: #1 ranked USC, #9 Stanford, Arizona, Arizona State, California and Oregon. Stanford wins the 70th Western Intercollegiate by 10 strokes over top ranked USC led by another brilliant win by junior Maverick McNealy. McNealy finished 16 under par on rounds of 66-64-64 194 to win by two strokes over Oregon's Aaron Wise. McNealy's 194 tournament total not only breaks the Western Intercollegiate record by 5 strokes but also is the all-time low for a Stanford player in any tournament. Since 2007 the next lowest tournament score was by Patrick Rodgers at The Goodwin in 2014 when Rodgers shot a 196 total. “It was a great team effort all the way around for the win,” said Conrad Ray, Stanford’s Knowles Family Director of Men’s Golf. “Maverick’s play was superb, and for him to break the scoring record of a tournament that has so much history and on a course that was so challenging is really a feather in his cap. Maverick's 2nd 64 included 5 birdies, an eagle and only 1 bogey. It was his 4th win this season and 10th career win in the past two seasons, leaving Maverick only 1 win behind the all-time school record of 11 wins by Tiger Woods and Patrick Rodgers. McNealy and Wise were named today to the 2016 Ben Hogan Award semifinal list. Franklin Huang had a solid tournament finishing tied for 8th on rounds of 68-71-70 209 while David Boote tied for 12th with rounds of 74-66-70 210. Brandon Wu tied for 28th with rounds of 70-74-72 216 while Viraat Badhwar (70-72-77 219) and Jeffrey Swegle (71-75-73 219) tied for 42nd. Playing as individuals Bradley Knox tied for 49th on rounds of 75-72-74 221 and Dominic Francks tied for 65th with 78-71-77 226. Next up is the Pac-12 Championship held in Utah April 29-May 2nd. The Cardinal moved into 1st place after round 2, 3 strokes ahead of Oregon and 6 ahead of USC with the day's low round of 3-under par 347. Once again Stanford was led by Maverick McNealy who fired a sparkling 6-under par 64, only 1 shot off the course record. Maverick's round included 7 birdies and only 1 bogey. Maverick is 2nd individually (66-64 130 2nd) only 1 stroke behind Aaron Wise of Oregon. David Boote also had a special round of 66 on five birdies and a lone bogey as he is tied for 14th (74-66 140 T14). Franklin Huang is tied for 8th (68-71 139 T8) after another solid round, while Viraat Badhwar is tied for 24th (70-72 142 T24). Brandon Wu is tied for 40th (70-74 144 T40) and Jeffrey Swegle is tied for 47th (71-75 146 T47). Playing as individuals Bradley Knox is tied for 56th (75-72 147 T56) and Dominic Francks is tied for 60th (78-71 149 T60). Stanford finished the first round in 2nd place, 4 shots behind Oregon, with a 5-under par 345 team total. The Cardinal was led by Maverick McNealy's 4-under 66, a round that included 5 birdies, an eagle and 3 bogies. Three of McNealy's birdies came on three of the toughest holes, the par 3 third, the par 4 11th and the signature par 4 16th. Maverick is 3 strokes behind the individual leader, Aaron Wise of Oregon who tied the course record with a 63. Franklin Huang's 68 included 4 straight birdies on the holes 6 through 9. Brandon Wu and Viraat Badhwar shot 70, Jeffrey Swegle a 71 and David Boote a 74. Playing as individuals Bradley Knox had a 75 and Dominick Francks a 78. Team standings and Stanford scorecards for round 1 are shown below.